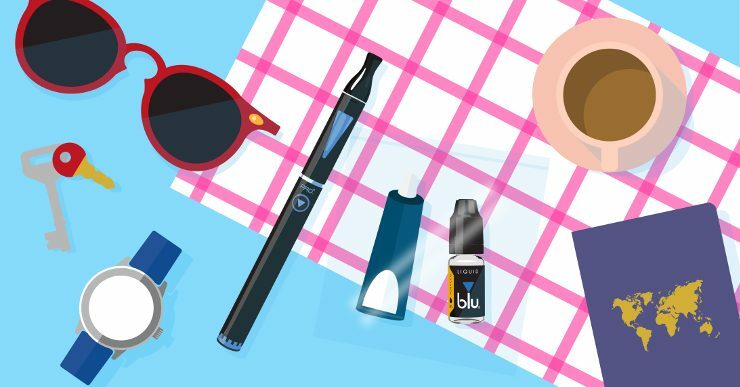 Don’t take any chances this summer – take a look at our guide to taking your e-cigs on holiday! You can’t use your e-cigs on planes anymore, so grab a vape break before you head to the check-in desk. You’ll also need to put your e-liquid in a suitable container before taking on board. Keep your e-liquid bottles or tanks in a clear plastic bag – usually supplied by the airport – and don’t take more than 100ml of liquid with you, or you could find it taken off your hands! Make sure to wrap your e-cig, including any spare clearomisers and e-liquid, in paper towels and place in a sealed bag before take-off. The change in pressure experienced during flight can cause liquid containers to leak, and this way you’ll stop your e-liquid from getting all over your bag. Getting the hang of e-cig laws in the UK is easy enough, and as a last resort you can always ask someone if you’re not sure. But what happens if you’re abroad and you don’t speak the language? Getting to know the local vaping laws is important, as there are actually a lot of places where vaping isn’t allowed. Mexico and Brazil are just two countries where e-cigs are completely banned, and many have specific laws on how large the device can be and whether you can buy e-liquid containing nicotine. The best thing to do is to do your research before jetting off on holiday, and our guide to Global Vaping Laws is the perfect place to start! 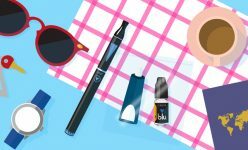 You may spend the summer looking for the hottest spots to relax and get your tan on, but make sure you look out for your e-cig! The heat isn’t good for it as it can harm both the battery and the e-liquid. When heated up, the flavour of your e-liquid can change, leaving you with a vape that nobody’s gonna want! The heat can also leave your e-liquid a lot runnier than you’d normally expect, and this can affect the way that it’s vaporized. Heat can also have an adverse effect on the nicotine in your e-liquid, causing it to break down and lose its potency. It’s worth keeping your e-liquid nice and cool to make sure you get the best vape possible. Some people even like to keep their e-liquid in the fridge to make sure it’s as fresh as possible before they start vaping. If you let your battery heat up over 38°C, you might find that your battery won’t hold as much charge as it used to. The heat can affect the cells in your battery, so try to keep it out of the sun. It’s not just direct sunlight that can damage it though, and leaving it in a hot car can also damage the battery. If you’re at the beach, you might even want to keep your e-cig in a plastic bag inside a cooler.